Huissel, a sheetmetal-part supplier to the European automotive industry, found that its current press lineup could not meet production needs for medium and high lot sizes, in part due to difficulties in job setup and operation of these presses. In response, the company chose to add a Schuler MSP 800 800-ton servo press. With the MSP 800, operators can select from predefined motion curves or program them freely. And, a component of the control system, Smart Assist software from Schuler, performs die setup step by step, providing an important advantage for Huissel. “In this way, we can shorten the usual launch of production to a fraction of the previous time,” says Schug. Thanks to a digital twin, commissioning of the new press also becomes a timesaving function. Here, a virtual stamping-system model connects to the real press-control system, allowing all MSP 800 functions to be simulated on a computer. This enables press functionality and operation to be tested, and operators trained, virtually. Another plus: The tie rod structure of the MSP 800 provides rigidity to help guarantee part quality. To house the new press, Huissel is constructing a new building in its Enkenbach-Alsenborn, Germany, factory. As a whole, this project represents the largest single investment in the company’s 100-year history. Huissel also intends to pair dies manufactured in its Frankenthal factory 25 miles away to the new servo press. Schuler debuted the MSP 400, a smaller version of the MSP 800, to the general public at the EuroBLECH trade fair, held in Hannover, Germany this past October. The smallest models in this same line, a CSP 100 single-rod automatic blanking press and a MSP 200 double-rod automatic blanking press, already have found use with metalformers, according to Schuler officials. Like all of the line’s models, these presses employ innovative knuckle-joint drives with dynamic servo motors and additional smart functions, such as condition monitoring. 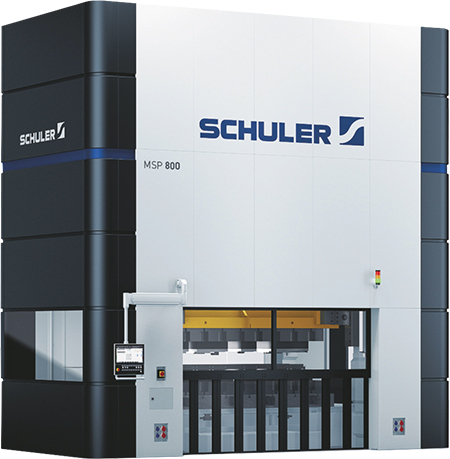 Schuler plans soon to add a 1250-ton model to the line.